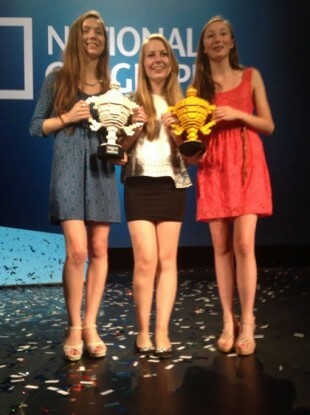 THREE TEENAGERS FROM Kinsale, Co Cork won a major international award last night, taking home the grand prize at the Google Science Fair in California. Ciara Judge, Sophie Healy-Thow, and Émer Hickey, Fifth Year students at Kinsale Community School in Co Cork, also came out on top in the 15-16 year-old category. Last night’s victory marks the third major success for the three, after they won the BT Young Scientist Award in 2013, and the EU Contest for young scientists. The Google Science Fair is an online competition which saw thousands of international competitors taking part, and five finalist projects, in an event at the company’s San Francisco HQ. Here’s a little about the girls themselves, and their revolutionary project on bacteria and cereal crops. Ireland is now firmly established as a centre of excellence for scientific research and it is encouraging to see Irish students play a role in furthering this reputation on an international stage. The students, their parents and teachers should all be very proud of their achievement. As a reward for their (latest) amazing accomplishment, the girls can look forward to an incredible, 10-day expedition to the Galapagos Islands from National Geographic, a trip to the Virgin Galactic Spaceport in Mexico. Kathleen O’Brien, Deputy Principal of the school told TheJournal.ie that their latest achievement was causing a huge buzz throughout the halls this morning. The whole school community is just over the moon – overjoyed. It’s so inspirational to see them representing their school, their country, and also women in science, like this. They are extremely bright and enthusiastic, but most importantly – they are so hard-working. That’s the example they’re setting for other students. Email “Irish schoolgirls take home grand prize at Google Science Fair”. Feedback on “Irish schoolgirls take home grand prize at Google Science Fair”.